I could do a one-word review of this album ("boring"), but I won't. I'll give the band enough time to tell them why I don't dig this album. It sounds like every other pop-punk band. And though every other pop-punk band always sounds like every other pop-punk band, a few of them do it well enough to hook you. 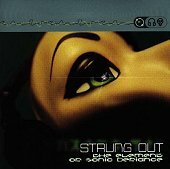 Strung Out does not. There is nothing new here. You'll listen once (if that) and go, "Heard it before," before passing it on to your friend and moving to something else. I'll give it a D.